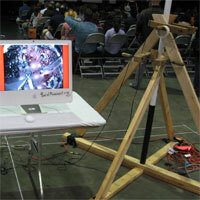 The Mobile Camera Tower is an inexpensive, quickly assembled mechanism for recording aerial footage of public spaces. The 40′ high portable tower assists the documentation and analysis of the structure of movement within architectural spaces. Featured at eTech 2007 and Maker Faire 2007. 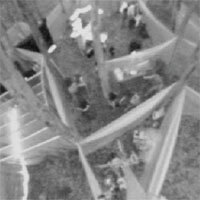 How does the design of an architectural space affect social dynamics? Can art stimulate social engagement and social movement? In this project-oriented Action Research course, 20 students worked collaboratively to plan, produce and document architectural interventions designed to induce observable social change. This production-seminar was grounded in a literature drawing from art, architecture, cognitive science, sociology, and urban planning. 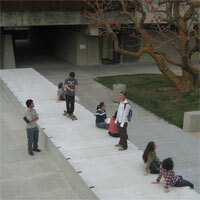 This CAT 124 course was the recipient of a $5000 Open Classroom Challenge Grant from the UCIRA. From the mechanically regular grids of UCSD’s Eucalyptus trees, a soft translucent structure spirals into an set of 25 rooms and passageways. The material construction of the Labyrinth enables it to act as a student-operated gallery, performance theater, and informal social space. 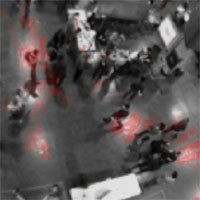 This is a MAX-MSP video technique for showing a time accelerated view of the recent past, so a participant can see themselves in the context of continually changing social structures. The camera records 10 minutes, then plays the footage back in just 1 minute. Then it continues, rolling forward in time, always showing a crowd’s movements at 10x speed. 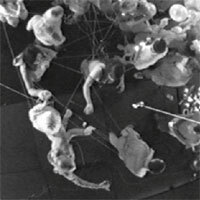 A highly rigorous analysis of the construction of social networks and the patterns of attentional flow within naturalistic party environments. 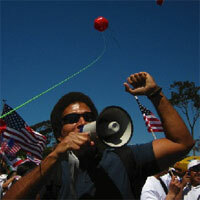 Using an 8 foot diameter red weather balloon, crowd structures at San Diego immigration rallies were analyzed and aestheticized.